Hooray! My first recipe since returning to Eating Richly after months of horrible pregnancy nausea. It feels really good to be posting again. I’ve missed you guys! This is a soup I’ve made several times over the past few years because it’s ridiculously easy and incredibly flavorful. 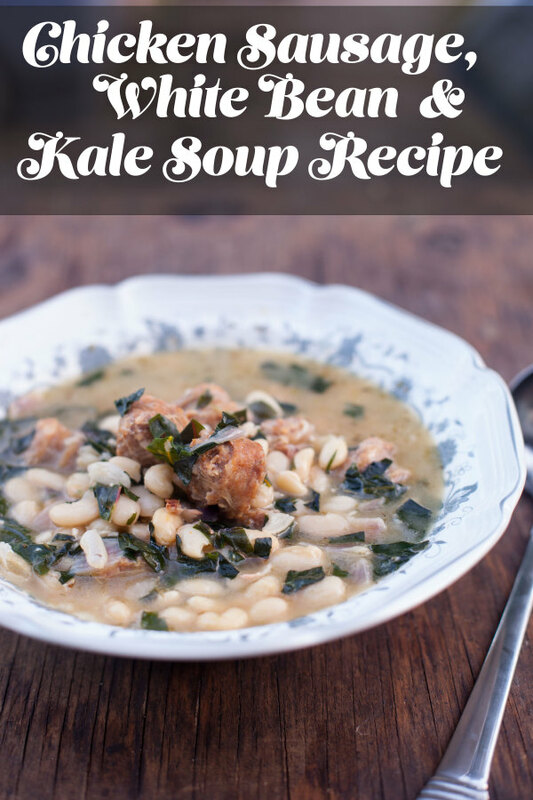 Big hearty chunks of chicken sausage, creamy white beans, and nutrient rich kale pair together perfectly with a bit of onion, garlic, lemon juice and thyme. This soup also freezes really well for an easy meal on a busy day. I can grow my own kale year round, it’s a hearty winter vegetable, but it’s also affordable in the grocery store. You can even save the stems of the kale in a veggie scrap bag in your freezer to make homemade vegetable stock, a great way to reduce waste and get more bang for your food buying buck. For the white beans, I buy my beans dried in bulk from Azure Standard. The long cook time comes from pre-cooking the beans in a crockpot. All the wonderful, flavorful bean cooking liquid also becomes part of the stock for the soup. I prefer to cook my own dried beans because I know exactly what is going in them (a lot of canned beans have added sugar and salt, in addition to metals from the can), and it’s quite a bit cheaper in the long run. While I find Azure Standard to be the cheapest, especially when buying organic, you can even get a great deal on dried beans in bulk on Amazon. By buying this set of four bags of dried beans from Bob’s Red Mill (another company I love! ), your cooked beans come out to less than 85 cents for the amount you would get in a can. Our cans of beans are usually at least 99 cents, and again, I don’t control the ingredients. I prefer to use organic chicken sausage, and find good deals on those at either Costco or Trader Joe’s. The fun thing about the sausage in this soup is that by slicing it into chunks before cooking it, the sausage chunks basically turn into chicken meatballs in the soup. While you could certainly make your own meatballs to save even more money, I find that using the pre-made sausage saves me quite a bit of time, and makes this a really easy recipe to prepare. Every time I make this soup, we eat half of it, and I freeze the remaining half in a gallon bag for a future fuss free freezer meal. Ooh, nice tongue twister! You can do the same, or even freeze the whole batch in two bags if you’re doing a freezer cooking day. This soup is also a breastfeeding friendly meal. Although I had to give up dairy while breastfeeding, I could still have hard cheese like parmesan which had very little dairy protein. But you can also simply leave the parmesan out. To eat the soup while breastfeeding, simply cut the chunks of sausage into smaller pieces, I use a pair of kitchen shears. Then you sip this out of a mug while you nurse. Just be careful that it’s not too hot in case you drip! I find that leafy greens are one of the hardest food groups for me to try and feed Corban as a toddler, not because he doesn’t like them, but because it feels like he normally gets overwhelmed by more than a couple bites of spinach, kale, or chard. But Eric and Corban are both a big fan of this soup recipe, which makes me happy because they don’t normally like to eat greens in their soup unless it’s blended. By chopping the kale pretty small, and having the chunky beans and sausage, they don’t really notice the massive amounts of healthy dark leafy greens they’re consuming. Hooray for toddler friendly family dinner recipes! Big hearty chunks of chicken sausage, creamy white beans, and nutrient rich kale pair together perfectly with a bit of onion, garlic, lemon juice and thyme. This soup also freezes really well for an easy meal on a busy day. Put the beans and water in a crockpot and cook on high for 3-4 hours, until beans are just soft. Turn off crockpot. Melt butter or coconut oil in a large pot on medium high heat. Add the chopped onion and cook, stirring occasionally until softened and just starting to brown. Stir in the garlic and kale. Continue cooking for 3-5 minutes, until kale is starting to wilt. Slice each sausage into 1 inch thick chunks. Add the sausage to the pot and stir it in. Cook, stirring occasionally, until the sausage has browned in several places. It doesn't have to be cooked through as it will continue to cook in the broth. Pour the stock into the pot and bring to a boil. Let boil for 10 minutes, then pour in the beans along with their cooking water. Add lemon juice, Parmesan, thyme, and salt and pepper. Make sure to taste as you go, the Parmesan is salty so you may not need as much salt as you might think. Approximate cost/serving: Growing my own kale reduces the total cost by another couple bucks, but if I buy a head of kale this comes out to about $6 for me to make. That's just $1 a serving, and we find it hearty enough that we don't need any sides with it. Dairy Free/Gluten Free: You can skip the parmesan if you need to make this dairy free, and just make sure your chicken sausage is gluten free.